Are some teams better than others against the spread? Below is a table with the ATS Winning percentages for the past 7 years. What is your first reaction after looking at those numbers? Please let me know anything interesting you see that I might be missing. 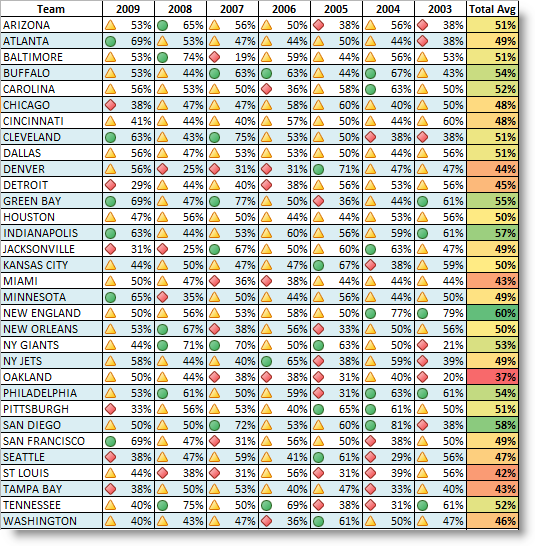 My first observations was that stronger teams (NEW ENGLAND, SAN DIEGO, INDIANAPOLIS) fare better against the spread than weaker teams (TAMPA BAY, ST LOUIS, OAKLAND). Secondly, I cannot find any pattern in terms of ups and downs. I was looking to find reasons for peaks and valleys, but there is not enough information here for me to reach a conclusion. 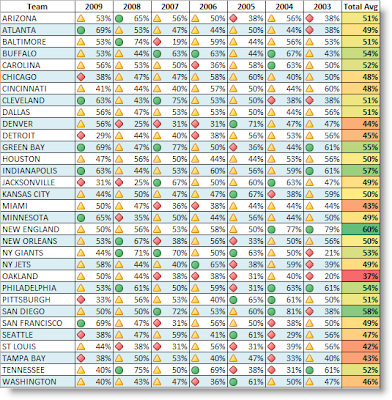 For example, why was Atlanta so high last year? Jacksonville has had two straight low season, what does that say about this year? When I evaluated this question in this 2007 article, I argued that the best places to find information about the results of teams is in the media. Over-hyped teams or under-achievers might be the ones to look for and bet accordingly. We will continue to let the model decide what games to pick and which side. Still, it is always interesting to me to see these numbers. Hello everyone, I am back from a loooong vacation from NFL point spread predictions. Work and family have kept me busy, so I haven't "trained" this off-season. I wanted to let you know that this blog is still alive and that we will be doing the same thing we did last year, hopefully with the same success. For the past 3 years, I have been publicly putting my statistically derived picks and my reputation on(the)line. I don't pick every game, only those with high probability of success. NFL point spread picks is all we do here. I have crunched more than 15 years of data, tried more than 100 different statistical methods, and had above 60% success rate in the past 3 years. Last year I started providing a betting strategy. This strategy is based on Kelly's formula which determines the percentage of your bankroll to use each week. I modified this formula and used our success probability to weigh each pick of the week. This helped us last year to reduce risk and improve ROI to the highest I've ever gotten so far, 93.9%. This year's picks/bets start slow the first 4 weeks of the regular season to capture enough data, and then we switch gears for some real profit making. I agree with Brian Burke in that predicting (hence betting) pre-season games is a worthless effort. Conclusion: We had a fun roller coaster ride. In the end it paid well, almost doubled the starting bankroll. Some weeks were rough and some were great and we knew this going in. Which is why I and you should never put all your eggs in one basket and do not rely on one week or game to make miracles. Minimize risk and look to make money in the long run.